The potential superstock for the week is LexinFintech Holdings Ltd (LX). LX is an online consumer finance platform in China for educated young adults in China. LX is a Fintech company as it Lexin integrates its e-commerce-driven instalment finance platform, Fenqile, with advanced risk management technologies, the Company’s Dingsheng asset distribution technology platform, and the Company’s Juzi Licai online investment platform for individual investors, to create a comprehensive consumer finance ecosystem. The Company utilizes technologies including big data, cloud computing and artificial intelligence to enable the near-instantaneous matching of users funding requests with offers from the Company’s more than 30 funding partners, which include commercial banks. LX has a short trading history having started trading in the NASDAQ only since Dec 2017. From Sep 2018 to Feb 2019, LX has been trading in a range from around $6.50 to $11. In Feb, price broke above the range but could not hold the gains. Last week, the stock spiked again to close at $13.06. The weekly volume was 5.56 million shares, more than twice its average trading volume. There was no news released last week related to the company so the spike might be due to the general bullishness on Chinese stocks last week. Due to the short trading history, I am unable to do a meaningful year on year EPS comparison for a longer run and can only compare its 2018 results with its 2017 results. LX's full year 2018 net profit reached CNY2 billion, representing an increase of 700% compared to FY 2017. Loans originated increased by 38.5% to CNY66.1 billion. LX's e-commerce platform Fenqile recorded GMV of CNY5.83 billion in 2018, an increase of 41.9% versus 2017. By any matrices, LX is a great growth company. In the fourth quarter, LX continued to increase the number of institutional partners and enlarge the scope of their cooperation with their partners. Total funding partners are now over 100 and approximately 70% of the new funding on their platform comes from financial institutions. This is partially in response to Chinese government's crackdown on P2P. Since Dec 2018, LX stopped the growth of the balances on P2P and are prepared to have all the growth this year being driven from institutions. LX's artificial intelligence risk management engine, Hawkeye, completed multiple iterations developing location-based concentration anti-fraud methods, new user risk profiles and smart diagrams, user repayment projection analysis and automated asset quality analysis and other new processes, greatly improving their risk management capability. At the end of last quarter, LX's 90-day-plus delinquency rate was 1.41%, maintaining a stable level. o Float of 58.4 million shares. With a trading volume of 700 thousand shares, float represents close to 85 times its average daily trading volume. + LX is trading at 8.2 times its trailing twelve months EPS. Chinese Regulations: Earlier this year, the Chinese government cracked down on P2P online lending and recent regulations reinforce that the local commercial banks have to focus on lending in the local area. These regulations are unpredictable and can have adverse effect on finance companies like LX. Non-recurring Revenue: Once the banks receive the client information, the banks serve the clients directly going forward and therefore, those borrowers need not go back to LX. LX will need to put in more effort to ensure that their customers are stickier and have the habit of coming back to engage with LX when they need a loan. As a child, teen or even adult, you have probably read or bought one of the books in the Chicken Soup for the Soul series. However, the potential superstock of the week, Chicken Soup for the Soul Entertainment, Inc. (CSSE), is not entirely about the books that we are all familiar with. CSSE was Chicken Soup's spin off of their video entertainment business in 2017. CSSE is a media company developing and operating online video on-demand (VOD) networks that provide positive and entertaining video content for all screens. 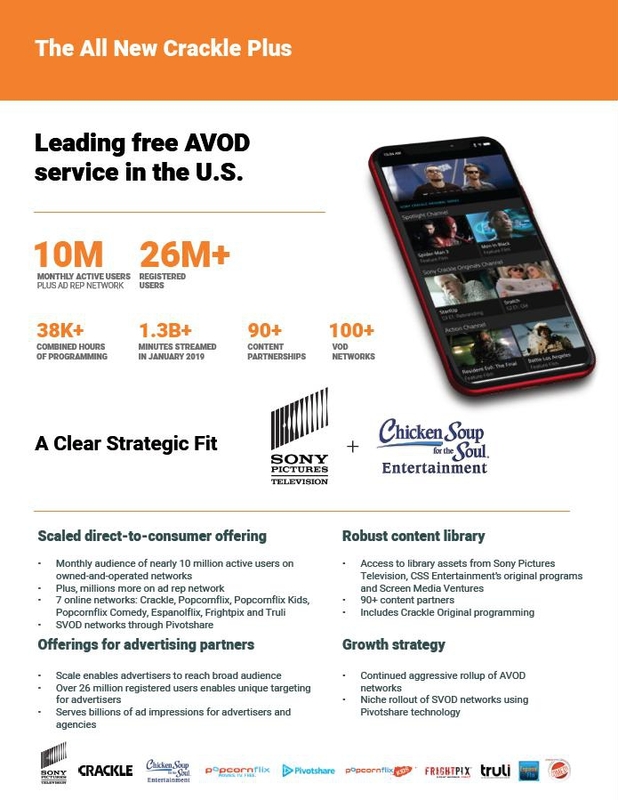 Advertising-supported video-on-demand: CSSE operates five global AVOD networks that are available online and through Apple iOS, Android, Roku, Amazon, YouTube, and more. They offers variety of content across multiple themes including family, kids, comedy and relationships. Subscription-based online video-on-demand: Global SVOD service offering channels across a variety of categories of content including music, sports, religion, arts and culture, lifestyle and family. CSSE only IPO-ed in 2017 so only had a short trading history. Its stock felled rather hard in the first few weeks. Thereafter, it traded in a rather huge range of $6.20 to $11.40. Last week, it broke above the range and closed at $12.36. The volume of the week was 1.37 million shares, 10.6 times its average weekly trading volume. The catalyst for the spike was news that CSSE is buying a majority of Sony's stake in Crackle. CSSE 2018 revenue was 2.5 times its 2017 revenue. Operating income for 2018 was $800,000 compared to an operating loss of $600,000. Without the non-cash film library amortization charge in 2018, CSSE would have had an operating profit of $6.5 million or 23% of total revenue, which is substantially greater than last year. CSSE will own the majority interest in the joint venture and in return, Sony will receive 4 million five-year warrants to purchase Class A common stock of CSSE at various prices. Crackle Plus is expected to have a combined audience of 10 million monthly active users on its owned and operated networks and over 38,500 hours of programming. The joint venture will also have a total of 90 content partnerships, over 1.3 billion minutes streamed per month and an offering of over 100 networks (both ad-supported and subscription-based). CSSE estimates that the Crackle plus joint venture will more than double CSSE's revenue and meaningfully increase its adjusted EBITDA which is expected to be around 25%. One of CSSE strategies is to roll up smaller networks, which really cannot compete, because there is no way that advertisers can go hundreds of networks placed there advertising. CSSE will be in a position to acquire and has a good track record of taking assets and make them robust. o Small float of 3.6 million shares. With a trading volume of 37 thousand shares, float represents close to times its average daily trading volume. + CSSE is trading at 6.6 times its trailing twelve months EPS. Overhead Resistance: CSSE IPO is priced at $12 and opened at $13. Investors who bought on the first day of IPO might have waited for more than a year to breakeven and choose to sell the stock. Netflix: In terms of on-demand TV, there is nothing greater than Netflix and I am not sure if CSSE is able to keep up with its growth. The potential superstock of the week is NetSol Technologies' (NTWK). I have blogged on this stock in previously in October 2018. Then, it bought me a decent profit as I bought the stock at $7.67 and sold it at $8.92. Will it bring me more profit this time round? To recap, NTWK is a worldwide provider of IT and enterprise software solutions primarily serving the global Leasing and Finance industry. NTWK's primary source of revenue is the licensing, customization, enhancement and maintenance of its suite of financial applications under the brand name NFS™ (NetSol Financial Suite) and NFS Ascent™ for leading businesses in the global lease and finance industry. After I blogged about the stock back in October 2018, the stock has surged to slightly past $10. NTWK failed to hold its gains and fell quickly to a low of $5.16. It started to consolidated to form boxes. The most recent range is a $6.26 - $7.74 box since the start of the year. Last week, price broke above the range to close at $8.02. The breakout came with strong volume. The volume of the week was about 1 millions shares, 2.5 times its average weekly trading volume of 400 thousand shares. NTWK last reported its earnings on 13 February which did not cause large movements in the price of the stock so I am not sure of the reason for the spike last week. Including the current quarter, NTWK reported 6 consecutive quarters of year on year EPS growth. More importantly, it was a turnaround for the company as NTWK recorded its fifth consecutive quarter of profitability. Commenced implementation of NFS Ascent Retail platform at captive auto leasing company of a major US based auto manufacturer in China. Successfully began the implementation process of NFS Ascent™ Wholesale module in Japan for German auto manufacturing giant as part of the ongoing international deployment associated with the previously announced 12-country, $110 million contract. Initiated process to implement NFS Ascent Solution in Singapore, Malaysia, Hong Kong and Thailand as part of the previously announced 12-country, $110 million contract. At the beginning of the 2018, NTWK appointed Murad Baig as its Chief Innovation Officer, and tasked him with heading up the innovation lab. Murad came from Deloitte, where he led innovation, blockchain and disruptive technology across the firms, banking and securities practice. The dedicated team in the innovation has made progress on a number of key proof-of-concept, including customer retention focus AI, connected car implementation using IoT simulated data to simulate real-time driving behavior and a car sharing platform built on emerging technologies. Another key appointment is the appointment of Hui Liang as NTWK's new President for China, Hui will be responsible for expanding our already strong footprint in the APAC region and improving existing relationships with key customers. o Small float of 9 million shares. With a trading volume of 65 thousand shares, float represents around 140 times its average daily trading volume. + With the string of good results in the recent quarters, NTWK's valuation has dropped to 11.8 times its trailing twelve months EPS. Overhead Resistance at mid $9 - The mid $9 area has served as support and resistance for several times in the past few years. It will likely serve a a resistance in the near future, especially with the recent test at the end of last year. At current price, there is still good money to make if the stock did test the mid $9 region. Political Uncertainty in Key Vehicle Producing Markets and Countries - Trade negotiations uncertainty between the US and its key trading partners including China, one of its key customer base. Brexit will have an impact as NTWK had a NFS Ascent™ focused office in London to cater to European market. Products Segment: Market leader in real-time 3D imaging sonar technology for multiple subsea applications. World’s only real-time 3D sonar technology – “seeing both static and moving objects and measuring in real time in zero visibility conditions underwater” Other leading products include geophysical range of hardware and software and motion sensors for navigation. Services Segment: Long-established relationships with U.S. and UK Defense Primes, such as Raytheon, Northrop, and BAE, with a number of proprietary parts for significant programs such as Phalanx® CIWS, yielding long-tail recurring and growing revenues. In recent years each segment generated about half of CODA's revenue, with a higher gross profit margin for the products segment. CODA have a relatively short history in NASDAQ having uplisted from OTCQX only in July 2017. Since September 2018, CODA has been trading in a relatively tight range between $5.23 and $6.89. Last week, price broke above the range to close at $7.05. The volume of the week was 546 thousand shares, about 1.8 times its average weekly trading volume. The reason of the spike was the launch of its full series of patented Fourth Generation real-time 3D sonars. Including the current quarter, CODA reported 2 consecutive quarters of year on year EPS growth. CODA launched 4G series of sonars in February 2019, and plans to launch the final products within the 4G rollout in the second half of 2019. The new products has smart algorithms for the sonars and top-end software products for many new capabilities. The new products are lighter, smaller and requires less power than their third generation of products and is more competitively priced. This allows CODA to compete more effectively against other conventional sonars within this price bracket and applications where size, weight and price are key factors. CODA's R&D efforts are designed to capture new markets in the subsea defense space where new technologies such as underwater drones present new challenges for governments. CODA's real time 3D sonar technology is significant for the subsea defense market which is worth billions annually. Momentum has grown significantly within the U.S. Navy community to actively fund development, trials or purchases of Coda Octopus Echoscope® technology. during the fiscal third quarter, CODA entered into a Navy Cooperative Research and Development Agreement with Naval Surface Warfare Center, Panama City Division (NSWC PCD), for the multi-generation development of the Divers Augmented Vision Display-Head Up Display system (DAVD-HUD). This presents a significant opportunity for CODA to roll out their unique real-time 3D sonar capabilities, both hardware and software, across the Navy. In the same quarter, CODA entered another Navy Cooperative Research and Development Agreement, with Naval Surface Warfare Center, Crane Division. Under this agreement, NSWC Crane Division will evaluate the CodaOctopus® Underwater Inspection System (UIS), and Echoscope® technology, for suitability for a number of its critical operations. In both 2017 and 2018 fiscal years the Services Segment revenues and Net Income were substantially down and off plan due to the failure of new US Administration to pass a defense budget. The Services Segment has now started to receive the backlog orders that were due in both fiscal years 2017 and 2018 and have now contracted a backlog of $2,504,380 (for the 2017/2018 orders) and CODA expect the further outstanding backlog to be contracted in the first half of 2019.
o Small float of 3.6 million shares. With a trading volume of 13 thousand shares, float represents around 280 times its average daily trading volume. o CODA is trading at 13.6 times its trailing twelve months EPS. Brexit - CODA derives significant portion of their net operating revenues from their UK operations (both Coda Octopus Products Limited and Coda Octopus Martech). A No Deal Brexit will affect CODA in the area of costs associated with import/export arrangements for their products including custom duties on purchases and sales and delays and increased compliance costs in the supply chain (both purchasing and selling). CODA will also be affected by the fluctuations in British Pounds. To mitigate the effects, CODA have established a company, Coda Octopus Products A/S, in Denmark to maintain a presence in the European Union. Timely Execution of Mounting Backlog of Orders - With the backlogs for the 2017/2018 orders, the current level of the Services Segment's order book has grown to approximately $7.2m and CODA may have issues executing the backlogs in a timely manner. Italian food always have a place in my heart. Pasta, pizza and cheese come to my mind when planning a good night out. This week, I am excited with the potential superstock of the cause it is a company that produces Italian food. The company is Armanino Foods Of Distinction (AMNF). AMNF engages in the production and marketing of upscale and innovative food products, including primarily frozen pesto and other sauces, frozen pasta products, cooked and frozen meat and poultry products, garlic spreads. The stock has been trading lightly, mainly because it is an OTC stock. Between July 2018 and Jan 2019, the stock has been trading in a tight range between $2.75 and $3. In Dec 2018, the stock attempted to break above the range but failed and went back into the range a week later. Last week, the price broke above the range again and closed at $3.08. This time round, the volume was much stronger with 337 thousands shares traded last week, slightly less than three times its average weekly trading volume. There are two potential cause of the spike. Firstly, there was a Seeking Alpha article analysing the stock and suggesting the stock is undervalued with attractive dividends. Next, Alluvial Capital Management published its Q4 letter to partners. In the later, it provided detailed analysis of AMNF, calling it the "most notable newcomer to the Alluvial Fund portfolio" and the "simplest business we've ever owned". Including the current quarter, AMNF reported 9 consecutive quarters of year on year EPS growth. AMNF is ramping up their pursuit of potential opportunities in several new US domestic market categories. To do this, AMNF is investing approximately $750,000 to add new manufacturing equipment to help them compete effectively in these new markets. AMNF's current dividend yield is around 3%. More importantly, they have increased their dividend for over 10 years. This comes with strong growth as AMNF grew its earnings at an annual pace of 12% since 2010 while paying out nearly half its earnings in dividend. Recently, AMNF increased its dividend by 12.5%, and there is still room for AMNF to increase its dividend further with its strong cash balance. - Small float of 30 million shares. With a trading volume of 22 thousand shares, float represents around 1364 times its average daily trading volume. - AMNF is trading at 15.4 times its trailing twelve months EPS. Low Volume - With a 22k average volume, the spread and slippage might be high, and it will take a big surge in volume to move the stock. Change in Consumer Preference - There is a massive rise in plant-powered eating, causing a lower consumption in cheese, one of AMNF's key ingredients. Consumers may continue to move away from AMNF's products towards plant based pestos. All information in The Trader Diaries (TTD) does not constitute to investment advice or recommendation to buy, sell or hold. Readers are advised to consult their financial advisors prior to making any investment or pursuing any investment strategy. TTD will not be liable for any losses resulted from information published or shared from the blog. Hi there! I am Wilson. I am a Singapore-based statistician who has been trading part time since 8 years ago. My trading style is influenced by techno-fundamentalists like Mark Minervini, Jesse Stine and O'Neil William. I am also a fitness enthusiast who enjoys Bodypump, Bodycombat and hot yoga.